Couch to 5K in Just One Day! Couch to 5K in just one day! Yes, you can do it. I did (against my will and despite my better judgment). While I don’t necessarily recommend it, I have decided to write a how-to book, or a column, or perhaps just a few sentences. As the infomercials say, here’s how it works. First, don’t do any exercise for weeks in advance (or you’ll foil the experiment). This part will be difficult for a few, but most people I know have mastered it already. Second, on the day of the race, find an old pair of shorts, show up, register, and get a cool t-shirt to wear in the race. Be sure to admire the people who are running to warm up, but don’t waste any energy on such foolishness. You’ll need all your strength shortly. Finally, stay near the back of the pack at the starting line, and don’t run when the gun sounds. That clears out lots of foot traffic for you quickly. Run. Walk. Run. Walk. Walk. Walk some more. Walk. Then when the finish line is in sight, jog slowly but with confidence. Voila, couch to 5K in one day. The real question you might ask is why any sane person would do such a thing, especially someone like me who knows the Boy Scout motto, “Be Prepared.” Enter my brother, Frank. Yes, this is the same Frank that many of you read about in the Christmas edition of the Town & Gown magazine – the one who named me “Brother.” Thank you for the many kind comments about how you enjoyed reading about our catching the bed on fire with sparklers and shattering my mother’s antique spinning wheel into shards. Oh, that such bad judgment could be relegated to childhood. Alas, it is not. I still remember my first 5K when a woman pushing a baby stroller casually blew by me, crushing my masculinity and competitiveness. My brother is unmoved as I explain the concept of preparation. That settled it. 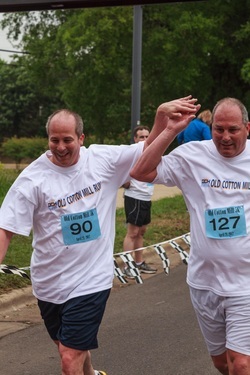 I knew it would be even harder for him than me, so we’d run together to support each other. He took off quickly with his son at the start. My son asked if we should catch them. I assured him they would come back to us. After one mile, we caught them and our sons jogged ahead (eventually going out of sight). We did, and I had to admit it was fun. Our boys enjoyed it and laughed as they saw us laboring to finish. My brother was right (again), and I was wrong. You can go from couch to 5K in just one day!